MOSCOW. 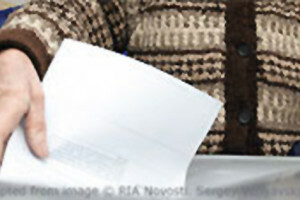 Sept 19 (Interfax) – The chair of Russia’s Central Elections Commission (CEC), Ella Pamfilova, has revealed that CEC members are shocked at the extent of electoral law violations committed during the second round of the gubernatorial polls in Primorye, adding that a probe will be held “without respect of those who organized the election rigging”. “This is the case where such excesses suddenly happened. The violations committed during the final stage of the second round, when people were repeatedly voting, have shocked us. Without respect of persons who acted or on behalf of whom [the fraud was committed], or who was the organizers – regardless of who organized those bad things that happened during the final stage of vote counting, without exception of persons, we must conduct a full investigation and those responsible must be punished,” Pamfilova said on the 60 Minutes show on the Rossiya television on Wednesday. “There is a clear stance of the president,there is a clear guidance form the president that elections in the country must be decent, must have credibility among people. People need to be clearly sure that if they go to the polls, their voice will be heard and their vote accurately recorded,” Pamfilova said.